Hello everyone! I am very excited to be able to tell you that I have joined up with some great bloggers to co-host The Yuck Stops Here link party. I encourage all of you to link up with us and share all of your wonderful, YUMmy recipes! Since this is my first week, I’m still learning my way around, but I know it’s going to be a lot of fun meeting everyone! Welcome! Welcome! This is the fifth week of The Yuck Stops Here link party. What a great week we had last week, lots of yummy recipes and tips! Please remember that this is a RECIPES only party, recipe tips are welcome, but crafts, etc. belong somewhere else (not that we don’t LOVE them, we’re just sticking to recipes here)! We’ve changed our start and end times! The party now starts every TUESDAY evening at 8pm Eastern Time and ends the following Sunday at 8pm ET. That gives you plenty of time to link up and to visit eachother’s awesome posts! We’re still looking for a few good hosts! If you would be interested in joining us in our effort to Stop the YUCK everywhere, hop over to our The Yuck Stops Here Hosting Info page for more information. Here in my home we hear the word “Yuck” WAY too often. This is a party to gather recipes that can be used in homes everywhere to reduce the number of times we hear THAT word. Here you’ll find lots of YUMMY recipes from great bloggers everywhere. Link up your own & enjoy the delicious talents of others who have linked up theirs. Don’t Re-link (if you’ve linked it here before, don’t link it here again). MEET YOUR HOSTS! Please follow each host via at least ONE social media platform, and visit each host’s website to check out their features for the week! This is Erlene’s last week with us as a co-host. I want to sincerely thank her for all the hard work she put into getting this party off to a wonderful start. I don’t think I could have done it without her help, support and patience. I am sorry to see her go and wish her all the best in her many future endeavors! HUGS to you Erlene! Please welcome our newest co-host, Chrystal Mahan! We’re so happy to have her joining us 🙂 , especially since Erlene is leaving us 🙁 ! Chrystal’s Blog – Yum Eating, you’ll have a lot of fun checking her out! Summer Pasta Salad from Just a Mum. I have to say, I was drooling when I checked this one out. You can’t go wrong with a great pasta salad for all of those Summer Bar-b-ques, picnics and potlucks! Congratulations! Don’t forget to grab your “I Was Featured” button. 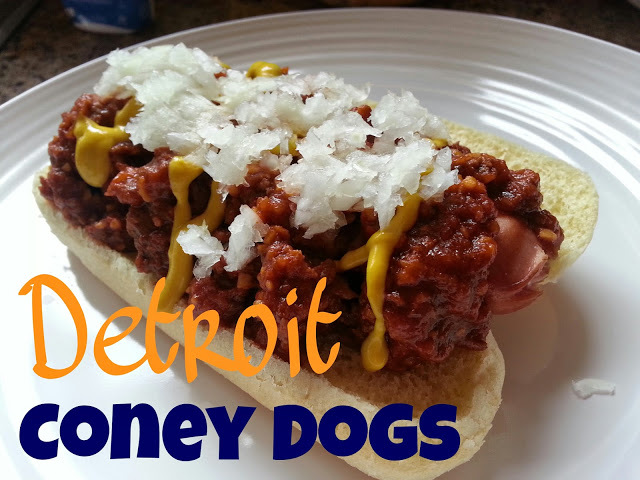 Maybe I am a bit biased, by my personal feature for the week is Katie’s Detroit Coney Dogs. Katie blogs over at How to Make the Sun Shine. I live almost an hour north of Detroit, but I love to go as often as I can. Not just for the ball games, but Detroit houses some of the best eateries in this state! Please stop by and show Katie some love! If you were featured, grab an “I’ve Been Featured” button to show how awesome you are! If you want to be featured you MUST link back to our party in some way. To do so grab our link button (mine can be found in my sidebar) or simply include a link back to our party in your post. Here is a tutorial on how to do that. Oh my gosh! you guys are so sweet! Thank you for showing my Detroit Coney Dogs! I am so flattered! When I told my husband you guys featured this recipe, he said “you should probably make them again.” lol. This is such a great linkup party! You are very welcome. I am a huge fan of all things Detroit! I’ve had Flint style, ummm no. My husband likes them. I think its NY style that does the kraut and mustard. I love that. Reminds me of dishes my grandmother made. Your’s reminded me of the big sloppy ones at Tigers games. YUM! Thank you, also, for hosting this linkup. Can’t wait to try some of the other recipes! Glad you are enjoying the link party Katie!